What information does APIC collect and how is personal information used once it is collected? Most information that APIC collects is used only to help APIC better serve its users. In general, we collect the information that you provide to us when you register to use this website, when you provide us with information and comments through the site and when you send us e-mail. It is APIC’s general policy to collect and store only personal information that its users knowingly provide, and that APIC can use to improve the range and quality services to users of the website. Information collected online is usually defined as being either “anonymous” or “personally identifiable”. “Anonymous information” refers to data that cannot be tied back to a specific individual. When you visit this site, APIC may passively collect other kinds of information through the website log files or cookies, including the location from which you visit us, the kind of browser you use, the date and time you visit the website, and the amount of time you spent viewing the website. Generally, APIC gathers this information for the purpose of analyzing aggregated trends and statistics. Aggregate data are only used for internal and marketing purposes and do not provide any personally identifiable information. “Personally identifiable” information refers to data that tells APIC specifically who the user is. APIC does not collect any personally identifiable information from users browsing its public website unless they provide it voluntarily. Users wishing to participate in any transactions through the website are required to provide APIC with a variety of necessary and personally identifiable information. 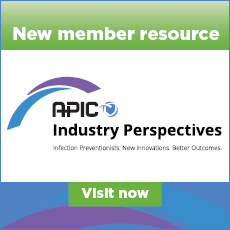 In addition, to gain access to “Members-only” resources and personalization features on the APIC website, members are asked to provide limited personal information. APIC asks members to provide their name and member number for login purposes, and to verify contact information for abstracts, conference and meetings registration, and purchase of APIC products to obtain the discounted price. All of this information is submitted voluntarily. APIC may store and process your personally identifiable information to better understand your needs and how we may improve our services, and we may use your personally identifiable information to contact you (for example, we may send you marketing or promotional materials or other information, we may respond to your comments or requests for information, or we may contact you if needed in the course of processing your requests). APIC may also use your personally identifiable information in accordance with any agreements that you may have entered into with APIC. In general, APIC will not give or sell your personally identifiable information to any outside organization for the organization's own use apart from APIC, or unless as permitted under any other agreement that you may have with APIC. APIC may, however, grant access to your personally identifiable information to groups that share similar goals with APIC, such as individual APIC chapters and their leadership, to the Society for Healthcare Epidemiology of America (SHEA), and the Centers for Disease Control and Prevention. Subject to applicable law, we and our service providers disclose and share your personal information among APIC and its business associates to unaffiliated third parties that are under contract to perform services for or on behalf of APIC (e.g., vendors hosting this website, e-mail fulfillment services, and the like), to a third party as discussed in “Transfer of Business Assets,” and to other persons as permitted or required by applicable law or regulation. Nothing in the Privacy Statement shall be deemed to prohibit APIC from disclosing your identity if APIC is required by law to do so. 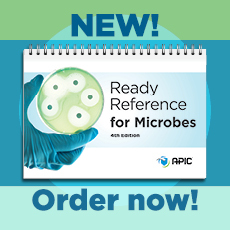 What are “cookies” and how does APIC use them? Why does APIC collect credit card account information and how is it used? APIC collects credit card account information from users in order to process a transaction with a user made through the website. When members choose to use their credit cards, APIC submits the information needed to obtain payment to the appropriate clearinghouse in order to process the transaction. Except as needed to process a transaction, APIC does not disclose credit card account information provided by its users. APIC’s website contains links to other third-party websites. APIC has no control over, and is not responsible for, the information, links, privacy policies or practices of such sites. APIC will make reasonable efforts to keep secure the data you provide us and will take reasonable precautions, such as using a secure server, in an effort to protect your personally identifiable information from loss, misuse or alteration. APIC collects and stores credit card account information in an encrypted format. Although APIC endeavors to ensure the integrity and security of its network and systems, it cannot guarantee that its security measures will prevent third-party “hackers” from illegally obtaining information. APIC cannot be liable for any security breaches, either by APIC or any third party, as discussed in greater detail below. Will APIC be liable for acts of third parties? Although APIC will use reasonable efforts to safeguard the confidentiality of your personally identifiable information, transmissions made by means of the Internet cannot be made absolutely secure and this website cannot be absolutely protected against unauthorized intrusion. APIC will have no liability for disclosure of information due to errors in transmission or unauthorized or negligent acts of third parties. In addition, APIC will release specific information about you to comply with any valid legal process such as a search warrant, subpoena, statute or court order. We will also release specific information in special cases, such as if there is an attempted breach of security or a physical threat to you or others. Any information that is disclosed in public areas of APIC’s website, in online discussion areas, or on the Internet may become public information. Although we strive to protect our users' privacy, we cannot guarantee the security of information you post in these forums. Users should exercise caution when deciding to disclose personal information in these areas and disclose such information at their own risk. May children use this website? APIC intends that this site be used by adults and does not want to collect personal information from minors (children under 13 years of age, or any other age defined under applicable law). If a child has provided us with personally identifiable information, a parent or guardian of that child may contact us at the e-mail address or address provided by this website if they would like this information deleted from our records. APIC will use reasonable efforts to delete the child's information from our databases. What happens if APIC transfers its business assets? As we continue to develop APIC, we might acquire, buy or merge with other businesses or assets. In such transactions, customer information generally is one of the transferred business assets. Also, in the event that APIC or substantially all of its assets are acquired, both personally identifiable and non-personally identifiable information will be one of the transferred assets. How can users view or change their personally identifiable information? • update that information as required. We will then use reasonable efforts to remove your personally identifiable information from our files, unless we are entitled to retain it pursuant to an agreement that you have entered into with APIC. You may also contact us through either of the above methods to request the personally identifiable information that APIC has collected about you through its websites. APIC will use reasonable efforts to supply you with this information and correct any factual inaccuracies in this information.